Baby - 36" x 46"
Inspired by the popular adult blanket of the same name, organic cotton baby blankets feature the same chunky, cozy weave for soothing texture against your baby’s skin. 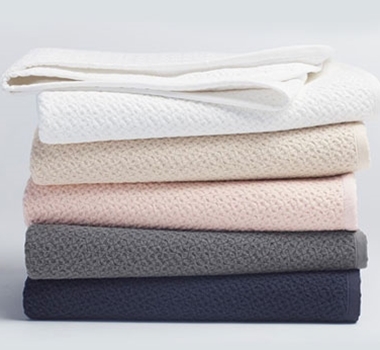 Soft yet substantial, durable and pet-friendly, organic cotton baby blankets are perfect for any season and now Fair Trade Certified™ Factory—just one more reason to love this customer favorite. Its chunky jacquard weave lends it weight and texture and locks in warmth. Made of pure organic cotton, it’s pre-shrunk to retain its shape, year after year and wash after wash. Piece dyeing creates variations in color that make each piece unique. These cotton blankets for babies are machine washable. We recommend using warm water, non-phosphate soap in the washing cycle, and a cool, no/low-heat tumble or line dry. The best way to dry, in our opinion, is to hang dry your Coyuchi products on a clothesline outside, capturing and bringing the magic of the outside back in. Wash with like items, wash whites and colors separately. For white fabrics, we suggest using non-chlorine bleach. Tumble dry on low heat or line dry these cotton blankets for babies. The use of bleaching agents may diminish the brilliance and depth of the colors, so we recommend not using any whiteners. But if you must, please use a non-chlorine bleach.